France is one of the most visited countries in the world, with good reason. It has amazing food and drink, incredible art and architecture, and a wonderful joie-de-vivre. But above all of these things, France has some simply stunning landscapes. All of this combines to make France one of the best cycling destinations in the world. You can spend your days whizzing around the varied terrain, from rocky, rugged coastline to sweeping sands, fertile vine-covered flatlands, rolling hills, and romantic canals, stopping off to explore some of the beautiful towns and villages en route. Then you can kick back in the evening and indulge in the French passion for eating and drinking. But with so many places to explore how do you decide where to stop off? 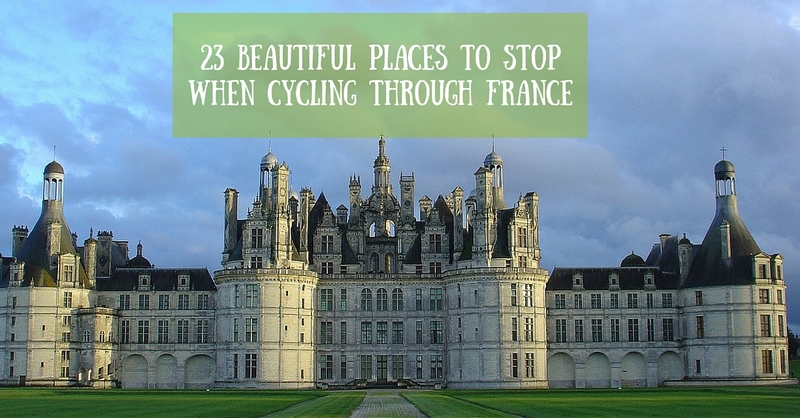 Fortunately, we have a useful guide to 23 of the most beautiful places to stop and explore on your French cycling tour. 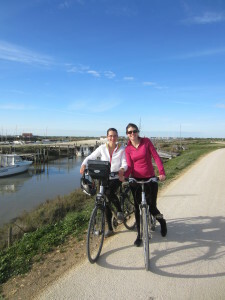 The tiny village of Ars-en-Ré on the Island of Ré on France’s west coast has been described as a ‘charming town of bicycles’. This simple, elegant village houses the main harbour for the island, with 500 moorings. Modern travellers are drawn here to wander around the harbour and the maze of enchanting streets, and sample the many cafés and restaurants. Surrounded by sea, saltmarshes, vineyards and market gardens, it’s the perfect spot to experience some laid-back French charm and simplicity. The French Alps are known for their upmarket ski resorts, but the region is also home to some stunning villages. Cream of the crop is Annecy, otherwise known as ‘Little Venice’, due to the flower-edged canals surrounding the terraces. The 14th century turreted chateau provides a stunning central focus against the backdrop of snowy mountains. It’s little wonder that visitors spend most of their time outdoors, cycling, hanging out in pavement cafés and gazing at the mountains from the shores of Lake Annecy. The entire Loire Valley is a UNESCO World Heritage site thanks to its architectural history and unspoilt nature, and the historic town of Amboise is one of its jewels. The most Italianesque of the towns on the banks of the Loire River, Amboise is home to two spectacular monuments from the Renaissance period: the Royal Amboise Castle and Clos-Lucé, where Leonardo da Vinci spent his last days. Stop here to wander along the esplanades and drink in views of the river. A popular tourist spot in Upper Normandy, Étretat is famous for its three natural arches and the white chalk cliffs that tower over the Atlantic Ocean. Stop to wander along the cliff edge, once a renowned painting spot for Claude Monet and other Impressionists, and climb down to the white pebble beach. The town itself is worth visiting too, to explore the markets and hike to the scenic church of Notre Dame de la Garde for dramatic views over the cliffs. The exquisite village of Locronan wowed all the judges of Le Plus Beaux Villages de France (the most beautiful villages in France), making it worthy of a stop. Its charm stems from its grand merchant houses, built with the proceeds of the local weavers and merchants who supplied fine sails to the French Navy, and British and Spanish ships. It’s also famous for its pilgrimage, Tromenie, which occurs every six years. The wine capital of the Alsace region, bordering Germany, Colmar is a colourful town, also regarded as one of France’s Little Venices. The town has a fairytale atmosphere, with brightly coloured half-timbered houses backing the flower-lined canals. Explore the vibrant streets, take a tour along one of the canals, or simply sit and enjoy a crisp Alsatian Riesling at a waterfront café. There’s plenty for culture vultures too, with the houses of Bartholdi, the sculptor responsible for the Statue of Liberty and Hansi, a local artist, to explore. Nestled amongst vineyards, almond groves and olive trees is the beautiful village of Lourmarin. The winding narrow streets are filled with numerous cafés and restaurants, old restored properties, and fountains, while the lavender-scented air leaves you in little doubt that you’re in the heart of Provence. The castle is worth exploring, and the road to Lourmarin is worth the trip itself, as it winds through cliffs and forests, with the odd hairpin bend thrown in for good measure. Another village on the Le Plus Beaux Villages de France list, Rochefort-en-Terre, is one of the most popular tourist stopping points in Brittany. The popularity of this village is thanks to French-born American artist Alfred Klotz, who bought a chateau here in 1907 and encouraged all residents to dress their homes with geraniums. This tradition has continued to the present day, resulting in Rochefort being a blooming beautiful place to spend an afternoon. While wandering round this arty town, look out for the unusual, colourful shop signs. Second only to the Eiffel Tower as France’s best-loved landmark, Mont Saint Michel is a UNESCO World Heritage site, rising 600 metres off the coast of Normandy. This rocky, peaked island, connected by a causeway to the mainland, is an imposing sight amongst sandbanks and powerful tides, which regularly cut the island off from the mainland. The highlight is the impressive Gothic-style monastery perched on top, while below visitors lose themselves wandering around the winding medieval streets. Provence has more than its fair share of charming villages, but Gordes is without doubt the most magical. Perched on the southern edge of the high Plateau de Vaucluse, the stone buildings are snug against the side of the cliff and built from the same warm beige stone as the 12th century castle. If you’re lucky enough to visit in the morning, the entire village glows warmly in the early sun and the views over the rocky, forested landscape are superb. The medieval fortified town of Domfront in Normandy enjoys a stunning location, with sweeping vistas over the Varenne River valley. Wander the old town, with its cobbled streets lined with half-timbered houses, and stop for refreshments in one of the open squares. If you fancy a little culture you can explore the church of Notre Dame sur L’Eau, once part of an important pilgrimage route, to marvel at the impressive frescoes and carvings. If nature’s more your thing, enjoy the surrounding rolling hills, forests and streams. A colourful town on the Alsatian wine route, Eguisheim is unique for its concentric-circle street layout, which runs around the central castle. The winding cobbled streets are backed with vividly painted houses, decorated with plants and flowers, giving the town a fairytale atmosphere. If you’re keen to sample the wines of the region, Eguisheim is a top spot to stop, with plenty of vineyards, wine bars and cellars representing local wine producers. The largest, grandest and most visited chateau in the Loire Valley, Le Chateau de Chambord sits at the heart of Europe’s largest enclosed wooded park. Originally conceived as a hunting lodge for King Francis I, it soon turned into an immense architectural creation, earning Francis the title of ‘architect prince’. The unique castle boasts 440 rooms, 365 fireplaces, 84 staircases, including the double-helix staircase reportedly designed by Leonardo da Vinci, and a cityscape of turrets and chimneys on the roof. A rural riverside idyll on the border of Normandy, Giverny is famous for being the birthplace of Impressionism. Claude Monet has his country retreat in this small village, and he personally planted the walled water garden here, featuring water lilies, weeping willows, bamboo, purple and white wisteria, and that iconic green Japanese bridge. His beautiful pink-shuttered house and gardens have been preserved to reflect the Monet years, and are well worth a visit. Perched on a rocky hilltop, the fortified citadel of Carcassonne looks like something from a children’s storybook, with its zigzag battlements, spiky turrets and stout walls. Indeed, this UNESCO World Heritage site was reputedly the inspiration behind Walt Disney’s Sleeping Beauty, with its atmospheric cobbled streets, drawbridges and towers. It’s an impressive sight to behold. The site of Beynac-et-Cazenac on the banks of the Dordogne has been occupied since the Bronze Age, thanks to its strategic location. Today, the village is easily recognisable due to the impressive castle, once besieged by Richard the Lion Heart. The village, nestled in the cliffs of the Dordogne, along with the castle and river are at the heart of what make this spot such a special location. Sitting on the border of France and Germany, the heritage city of Strasbourg has characteristics of both countries, and walks an equally fine tightrope between its medieval past and progressive future. This picturesque city has a magnificent Gothic cathedral, twisting alleyways with crooked, half-timbered houses, and an obvious fondness for flowers, and is also home to a glittering EU quarter. It’s worth cycling by in the run-up to Christmas to roam the famous Christmas markets and try the fabulous gingerbread. Regarded by many as Brittany’s prettiest town, Dinan is definitely a worthy stopping point on a cycling tour of the region. Featuring Tudor-style timbered houses, cobbled streets, and numerous arts and crafts shops, the highlight of this town is arguably its port. Lined with old stone houses, it’s home to some wonderful waterside restaurants – just the spot to refuel – and is the starting point of a charming walk along the old towpath. The Côte d’Azur has numerous heart-stopping views of the Mediterranean, but few are more dramatic than the sight of the coastline as the lift doors open at the Colline du Chateau. The shaded hill and park were once home to a 12th century chateau that Louis XIV burned in a fit of anger. Today it’s a maze of greenery with mesmerising views over the old town and the Baie des Anges. It’s quintessential Riviera – palm trees, promenades and that sparkling blue sea. If you fancy swapping the saddle for a climb, then the Île Vierge lighthouse in Brittany will reward you with a superb view. Located on an island in the Channel waters, cursed with some treacherous tides, you can pop over by boat (pre-booking is required) and climb the dizzying 397 steps to reach the summit. At the top of the tallest lighthouse in Europe, you can see the entire rocky Breton coast and look down at the churning white sea foam. France has its fair share of manmade wonders, with chateaus and cathedrals gracing many a landscape, but there’s little more awe-inspiring than the Millau Viaduct, the tallest bridge in the world. Designed by Sir Norman Foster, this cable-stayed vehicular bridge crosses the valley of the River Tarn. The bridge is so high that on cloudy days it appears suspended above the clouds. Another bridge in the south of France, this couldn’t be more different to the Millau Viaduct. The Pont du Gard is a massive Roman aqueduct built at the end of the pre-Christian era to cross the Gard River. A UNESCO World Heritage site, it’s a technical and artistic masterpiece, standing 50 metres high and arranged into three levels. Set in an area of stunning natural beauty, it’s one of the most visited sites in France. Located at the entrance to the famous Arcachon Bay in the Landes of Gascony, the Dune du Pilat is the highest sand dune in Europe. This itinerant sandy formation is a triumph of the shifting winds from the Atlantic Ocean, and has reached heights of 110 metres. Climb to the summit and you’ll be rewarded with stonking views of the ocean coastline, Arcachon Bay, the deep shoreline pine forest, the Banc d’Arguin nature reserve and, on a clear day, the distant Pyrenees. If you’re planning a cycling trip to France and wish to incorporate some of these beautiful places, contact Le Velo Voyager to discuss our range of tours.